Although Ajitgarh is known more for its commercial activities the town and its adjoining area have number of Gurudwaras which draws pilgrims from far and wide. Many of these gurudwaras have been sanctified by the presence of great sages including Sikh Guru Har Rai. We will start our tour with a visit to the Gurudwara Amb Sahib located in sector 8. The story of Gurudwara Amb Sahib started not here in Mohali, but in Amritsar during the time of Sikh Guru Arjan Singh. Bhai Kuram, who used to reside in a village called Lambian, once went to Amritsar to pay homage to Guru Arjun Singh ji. There he saw a devotee from Kabul offering a basket full of mangoes to the Guru. Those mangoes were then distributed among the devotees and Bhai Kuram received one as prasadam. However, he kept it aside. He was feeling wretched because Lambian was famous for its mangoes; yet he had neglected to bring any. Next day, he offered the same mango to the Guru and on being asked he explained the reason behind such an unusual offering. Arjun Singh ji then asked him to eat the mango and also told him that his offering will be accepted when the time comes. Years went by. One winter day, Guru Har Rai came here looking for Bhai Kuram. It was 1st of Po, the 10th month of Sikh calendar; it falls in the middle of December. Guruji found the disciple in deep meditation under a mango tree. Guru Har Rai asked for the fruit he had promised long ago to Guru Arjun Singh Ji. Bhai Kuram was dismayed and said he could not keep his promise because mangoes do not grow in winter. Guru Har Rai then asked him to look up and lo! The tree was full of ripe mangoes! Surprised, Bhai Kuram fell at the Guru’s feet. Guru ji then told him to distribute those mangoes among the gathering. Since mango in Punjabi is amb, the Gurudwara built here began to be known as Gurudwara Amb Sahib. It was built by Sant Baba Ishar Singh ji. It has now grown into a big complex. The sarai consists of 60 rooms with attached bath and seven halls. The rooms are mostly 2 or 3 bedded and the halls can accommodate180 persons. Accommodation in the halls is free while one has to pay a nominal charge for the rooms. Gurudwara Sant Mandal Angitha Sahib is located barely 500 meters from Gurudwara Amb Sahib. The place used to be the meditating centre for both Bhai Kuram Singh ji and Baba Ishar Singh ji. Later Baba Ishar Singh ji erected the Gurudwara at this meditation spot. Set up against lush green lawn this Gurudwara in white marble looks really awesome. It is a three storey building with balconies in ach floor. The domes at the top add to its pristine glory. When at night the Gurudwara is decorated with light, it shines like a jewel. While visiting the Gurudwara, do not forget to visit the Tapasthan of Sant Baba Ishar Singhji and Yadgar of Bhagat Kuram ji. Besides there are the Darbar Sahib, Darshan Deodi, Bhaura Sahi and Sarover Sahib to visit. Other than that, the complex also holds a large Guru ka Langar, Sahibzada Ajit Singh Ji Gurmat Sangeet Academy and different medical facilities for treatment of the poor. Apart from that, the complex has thirty rooms with attached bath. However, relatives of the patients undergoing treatment in the Fortis Hospital located nearby gets the first preference. Apart from the above mentioned gurudwaras, there are few others located within the town. Among them, Gurudwara Mata Sunder Kaur located in Sector 70 is worth visiting. The Gurudwara has been sanctified by the visit by Mata Sunder Kaur, the wife of Guru Gobind Singh ji and has been dedicated to her. Baba Deep Singh and Bhai Mani Singh are two other eminent personalities associated with this gurudwara. Gurdwara Sacha Dhan Sahib in Sector 60 Phase 3 is another important Gurudwara in Ajitgarh. Although no historical event or personality has been associated with it, it is one of the important Gurudwaras in the town. 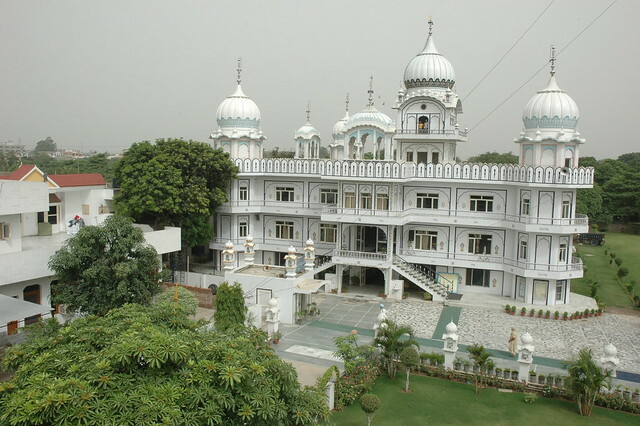 Gurudwara Singh Saheedan located in Sohana is another important Gurudwara to visit. Today, the place lies under the Ajitgarh Municipal area and barely takes fifteen minutes to reach. It has been dedicated to Jathedar Hanuman Singh ji and his five hundred followers who had laid down their lives fighting against the British during the Anglo Sikh War in 1845. The Gurudwara has been erected in the place they were cremated. The wooden shoes of the martyrs are still kept there.